If you are like me, at some stage you learned about the Waterfall methodology. Often the source of the waterfall methodology is attributed to Winston Royce and his paper: “Managing the Development of Large Software Systems”. Recently I have heard many people speak about this paper and imply that it has been misunderstood by the general audience. Rather than prescribing Waterfall it was actually recommending an iterative (or shall we call it Agile?) approach. I just had to read it myself to see what is behind these speculations. not pay for those activities and most developers would prefer not to do them. Problems with Waterfall Delivery – He then goes on to describe how the Waterfall model is fundamentally flawed and how in reality the stage containment is never successful. 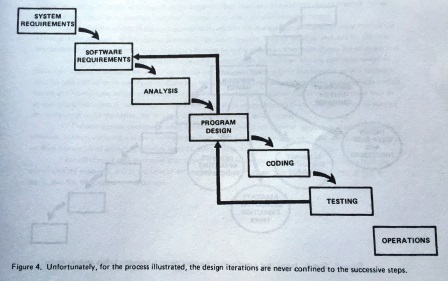 This pictures and the caption is what most Agile folks use as evidence: “Unfortunately, for the process illustrated, the design iterations are never confined to the successive steps.” So I think he again identifies the problem correctly based on his experience with delivery at NASA. Importance of Documentation – Now he starts to describe his solution to the waterfall problem in five steps. I will spare you the details, but one important point he raises is documentation. To quote his paper “How much documentation? My own view is quite a lot, certainly more than most programmers, analysts or program designers are willing to do…” He basically uses documentation to drive the software delivery process and has some elaborate ideas on how to use documentation correctly. A lot of which makes complete sense in a waterfall delivery method. Overall solution – At the end of the paper he provides his updated model and I have to say it looks quite complicated. To be honest many of the other delivery frameworks like DAD or SAFe look similarly complicated and we should not discount it just for that reason. I did not try to fully understand the model, but it is basically a waterfall delivery with a few Agile ideas sprinkled in: Early customer involvement, having two iterations of the software to get it right and a focus on good testing. approach is still closer to the Waterfall methodology we all know but he is going in the right direction of iterations and customer involvement. As such, I think his paper is neither the starting point of the Waterfall model nor the starting point of an Agile methodology. 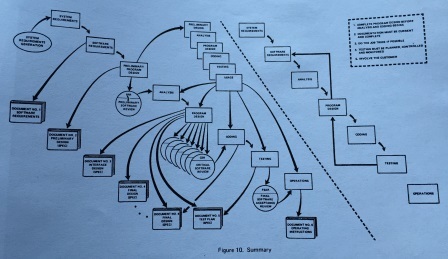 I think a software archaeologist would see this as an inbetween model that came before its time. This entry was posted in Agile and tagged agile, Agile methodology, winston royce on February 18, 2015 by Mirco Hering.